The invitation to Men’s Rights of Passage was something I looked forward to with great anticipation and apprehension. The invitation to bring a drum seemed somewhat strange. It brought to mind thoughts of half naked men gathered in ritual around a fire dancing in trance, invoking what ever spirit was invited to invade their very manhood. Nevertheless I was intrigued. I had no drum nor had I ever played a drum. I had no intention to go out and buy a drum, neither was there a drum to be borrowed. The first sound of the drum took me by surprise. Now this in itself was interesting; you see I come from Africa, the birthplace of Man, the birthplace of the drum, I had heard many a drum before but never have I put the two together, never had I taken much notice of the drum; to me it was a tribal thing and I had no tribe. I was of a different colour, it made no sense to drum, it wasn’t in my DNA, or so I thought. Furthermore I felt my Christian roots shunned the regular beat and rhythmicity created by the drummer beating upon a stretched piece of goatskin over a hollowed out piece of tree trunk, to summon up spirits or provoke those in trance to go beyond the normal natural capabilities of any a man. To me, drumming bordered on the mystical world of paganism. Little did I know how this first sound of the drum would have an impact on my life for years to come. As the drum beat to a steady rhythm, men stood in unison to follow its player, drawing closer to enjoy the camaraderie it inspired. Entering into the sacred space for the first time, I could sense this was something important. I picked up a drum, which I was drawn to, I sat in a chair, which invited me and joined in to play this unfamiliar instrument with about fifty other enthusiastic men. I never fancied myself as a musician; after all, I knew I couldn’t keep a beat. I was somewhat hesitant at first, but I soon realised I was only one among many who didn’t know what they were doing. I picked up the beat and followed as closely as I could, drifting off into my own dream world every now and then, only to be brought back into beat by the sudden change of rhythm by a young man sitting next to me. Slowly, gradually, eventually our rhythms became one, playing in unison as though under some spell. I knew then there was something about this drumming that intrigued me, intrigued me so much it warranted further exploration. It’s been six or seven years since I first heard an elder play that life-changing rhythm, a rhythm so deeply ingrained now in so many men’s memories. I started to read up on and explore what drumming was all about, not just from a tribal perspective but from science and medicine. My investigations took me on a virtual trip around the world, from the most ancient of tribal shamanic drummers to Miriam calling the women of the Jewish nation together for celebration and healing with her timbrel and then onto the more modern interventions of music therapy. I soon discovered the healing properties of a well-orchestrated rhythm. You see, drumming is something in all of us, no matter what our DNA. We all have rhythm. Some may argue against this, but its true, oh so true. Taking a step back to the beginning of life, before we were, who we are today, rhythm was bestowed upon each of us whilst we were deep within our mothers’ wombs. The gentle gift of a mother’s beating heart, the pulsing of her life giving blood has left its legacy in every single one of us. It has been passed down from generation to generation from the very beginning of time. For those of us who feel moved every time we hear or play the drum, pulled this way or that by its ever-changing rhythm, it is an echo from our time within the womb. The ever-changing heart beat to the daily rhythms of our mother lives, to her joys and her anguish. A reflection of her ever-changing heartbeat echoed in her ever-changing pulse. Life is like that, ever changing. I have discovered though that through drumming one may take a rest for a while from the pressures of life. As you concentrate on that rhythm, you know that rhythm. That rhythm that helps you re-asses where you’re at, you see the drum can draw you in, it can become your friend when treated with the respect that it is due. The steady rhythm, not much faster than that of a heartbeat, can bring you to a place of relaxation; a place where one can quiet easily enter into a meditative state bringing one closer to that threshold which many seek to journey into – quiet contemplation with our God. For me drumming took on a whole new meaning when I returned from Men’s Rights Of Passage (MROP). I knew if this could draw men together, it could work just as well for my students at school. I am fortunate to be a School Chaplain at a number of Special Education Schools catering for students with various disabilities. Social skills and self-confidence are often lacking amongst these students. I set my sights on bringing drumming into my schools, not just to teach the students how to play an instrument but to develop a recognisable drumming format that would promote social skills development through breaking down barriers by drumming together as a group in a Drum Circle. For the first three years or so I bought up as many drums as I could possibly afford. From never owning a drum, to having about 45 of my own goes to show how important this work has become. The more I drummed, the more passionate I became. I undertook a number of drumming workshops to familiarise myself with the therapeutic benefits of drumming and the drum circle. I devoured book after book on music therapy, devoting hours each day to get to better understanding of the drum. Now, I must reiterate this was not just any drum; my passion was for the Djembe, the hour glass shaped one with the skin on top and an opening bellow, a West African drum dating back many thousand of years. 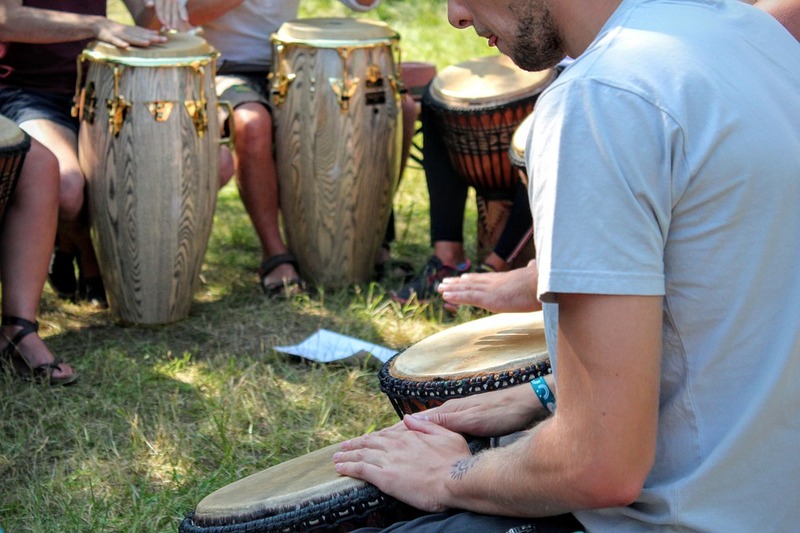 The word Djembe in some tribes means, “Bringing together in friendship”. However, I have moved on and have now embraced the importance of all hand held drums including those of the Native Americans, as well as many other percussion instruments and a few basic string instruments too, such as the harp and lyre. I have also embraced some traditional woodwinds, such as the Native American flute as well as the Tibetan bamboo flute. Over the years I have discovered that those instruments true to our origins evoke primal emotions and stir up our ancient spirit to get up and dance or go to war, to relax and pray or to be quiet and be at one with nature. My passion for working with students with disabilities and my passion for drumming melted into one. I soon found myself undertaking a Masters degree in Autism at Griffith University so I could better understand the students I worked with and how I could best serve them not only as a Chaplain but from an holistic point of view. My passion for drumming meandered through my studies incorporating all I knew and all I could find out on drumming into every assignment I wrote, bringing together disability and drumming, bringing together rhythm and connection, bringing together spirit and social skills, bringing together rhythm and speech, rhythm and maths, rhythm and story. I knew that what I had discovered was important. I had a picture in my mind what my path looked like at the end. I knew that when I read research articles and I stood up and paced my lounge floor back and forth, back and forth that something had stirred deep with in.